INTERGEO, the main European conference and trade fair for geodesy, geoinformation and land management, took successfully place again last October in Frankfurt (Germany). INTERGEO is one of the most important communications and networking fora for the geospatial community, with a high level of innovation from multiple industry segments: geolocation, UAVs (unmanned aerial vehicles), smart cities, digital construction, etc. This year’s slogan was “Geoinformation - the DNA of digitalisation”, stressing the importance of geospatial data as uniting element in the current technological era. 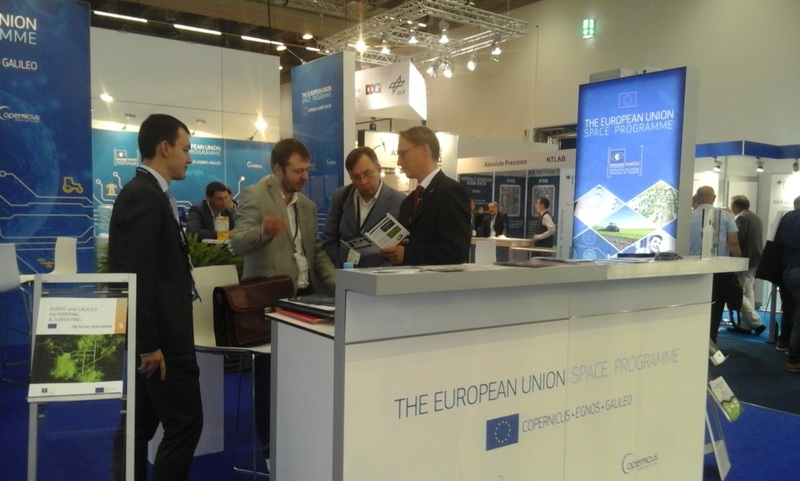 EGNOS was present in INTERGEO 2018, sharing the booth with the other two main European Commission space programmes: Copernicus and Galileo. Visitors were very interested in the capabilities of EGNOS for mapping and surveying, as it is a consolidated free-of-charge solution that provides submetric geolocation accuracy all over Europe. EGNOS can therefore support activities such as determination of areas and perimeters, inventory and control of assets, and management of natural environments, among others. In addition, the combination of EGNOS with Galileo and Copernicus widens the range and scope of these geospatial applications.